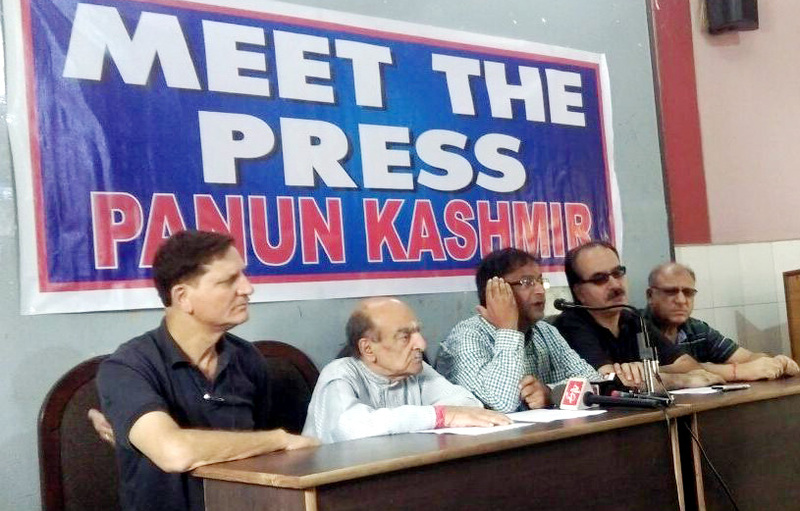 Brief of the statement issued jointly by Dr. Agnishekhar Convenor Panun Kashmir and Dr. Ajay Chrungoo Chairman Panun Kashmir during the press conference held at Jammu on July 13th, 2015. Panun Kashmir emphatically states that active denial of genocide of Kashmiri Hindus by the successive governments in the state and the Centre has been the most decisive encouragement of the Pan-Islamic fundamentalisation of the entire state of Jammu and Kashmir. If the governments meant to protect and uphold the fundamental rights of its people watch helplessly when the right to live and all other freedoms of a particular community are systematically destroyed, and choose to recognize the agents of destruction as potential peace makers, totalitarian regressive tendencies take control of the entire society. Panun Kashmir urges Government of India to recast its entire policy structure for Jammu and Kashmir in case it is really serious about putting a stop and reversing the processes of fundamentalisation of the social milieu In Kashmir and parts of Jammu. Without doing so the challenges posed by Pan Islamic Jihad which has ravaged the entire state and is fast spreading into rest of India and integrating with the international Jihad, cannot be effectively met. Government of India needs to recognize that the problem which it has lately started recognizing as “radicalization” is not a new phenomenon but a continuous indoctrination movement which has been going on in the state for a long time and which has been allowed by the State of India under one pretext or the other. Harnessing the wherewithal of the government, administration and the political establishment and using the freedoms provided by a democratic secular order has been hallmark of this movement of fundamentalisation. It is high time that the Government of India faces the stark reality that the Islamic fundamentalisation in the state is not happening through some medieval looking Madrassas but through an elaborate modern infrastructure of schools, colleges and Universities equipped with laboratories and libraries which can rival any school, college or University in rest of India. Why should it be so that institutions supposed to inculcate modern education end up churning fundamentalism, is the cardinal question which Government of India should try to answer? Government of India should understand sooner than later that a dangerous symbiosis has been institutionalized between the administrative set ups of the governments of the day as well as political parties expected to wean people away from regression, intolerance, separatism and violence. Does it have the political will to break this symbiotic relationship? We have all witnessed with shock and dismay the self deceiving rationalizations of the successive governments which reduced the whole debate on terrorist threat in the state to the comparative numbers of killings and incidents of violence. While the militarized fundamentalist regimes were declaring their presence by hoisting and flaunting their flags. The leadership at the helms has been indulging in trivializing these happenings by describing them as propaganda stunts. Most dangerous has been the tactical and strategic formulations which have guided Government of India. It invested heavily in breeding some sort of non-violent separatism and fundamentalism and ended up only building legitimacy for separatism and giving birth to new cadres for fundamentalist violence. Government of India has to realize fast that secularism does not grow by political empowerment of communalism, fundamentalism does not vanish by befriending it, and separatism doesn’t die by nourishing soft-separatism.